This morning I have been whistling snippets of Mendelssohn’s Overture to A Midsummer Night’s Dream. This pleased me because I love that music and because I was happy to note that I was whistling again. I haven’t whistled much these last years. I think maybe one has to be more lighthearted than I am or have a younger mouth than I do. In any case, this morning’s whistling sounded pretty good to me. I started whistling when I was very young. I remember wandering around the backyard in Detroit just whistling. I don’t know how I learned to whistle, but I was proud of my skill. I did love to whistle Zip-a-Dee-Doo-Dah long before I understood the baggage that went with the song. My dad was a whistler, too. Sometimes, when we were stuck waiting in the car, Dad would whistle to amuse us children. He would whistle Khachaturian’s Sabre Dance and other war horses. When I was in college, I used to whistle as I walked home alone at night from class or the library, but it wasn’t because I was scared. It was because it was dark, maybe a little damp, and because the music I made sounded beautiful to me. I whistled the love theme from Zeffirelli’s movie Romeo and Juliet, various bits from Grieg’s Peer Gynt Suites, “I am a Maid of Constant Sorrow,” and, of course, the Sabre Dance. For many years, I whistled a bit of Eine Kleine Nachtmusik, ditties from medieval Christmas music, and whatever else my ear and mouth could pick up. Late this morning, it finally dawned on me why I was whistling the Mendelssohn. It was Midsummer yet again, 42 years after Tom and I were married in Salt Lake City. That was long before life became so–I don’t know, less a romantic ideal and more visceral and earnest. We were lucky then with our dear family and friends with us to celebrate and we are lucky now to have each other still, even if the whistling is halting and off-key. This entry was posted in Memoir, Music and tagged awakening rose, Detroit, Eine Kleine Nachtmusik, High Sierras, I Am a Maid of Constant Sorrows, Judy Collins, love theme from Romeo and Juliet, Peer Gynt Suites, Sabre Dance, Salt Lake City, Since You've Asked, whistling on June 20, 2016 by lyndaterrill. To me, the title of this post sounds like these words should be in an anthology of sentimental pioneer stories written in the late 1800s. This is the title I want, however, so I am wondering where these words will lead me. Looking Backward: Forty years ago next June, my sister-in-law, Betsy, made my husband, Tom, and me a quilt as our wedding gift. It took many months for the whole project to come together. 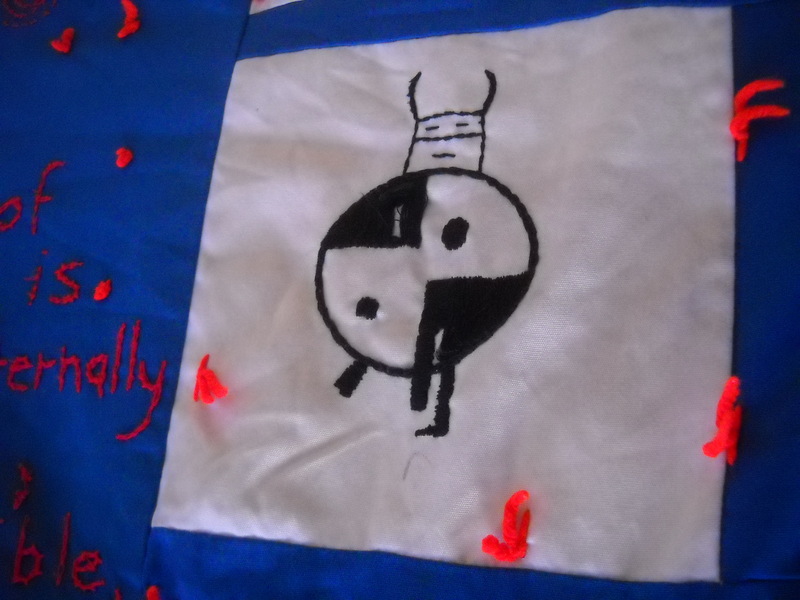 Tom drew Hopi designs (or at least what Frank Waters thought were Hopi designs) on squares of cloth and Betsy embroidered them. 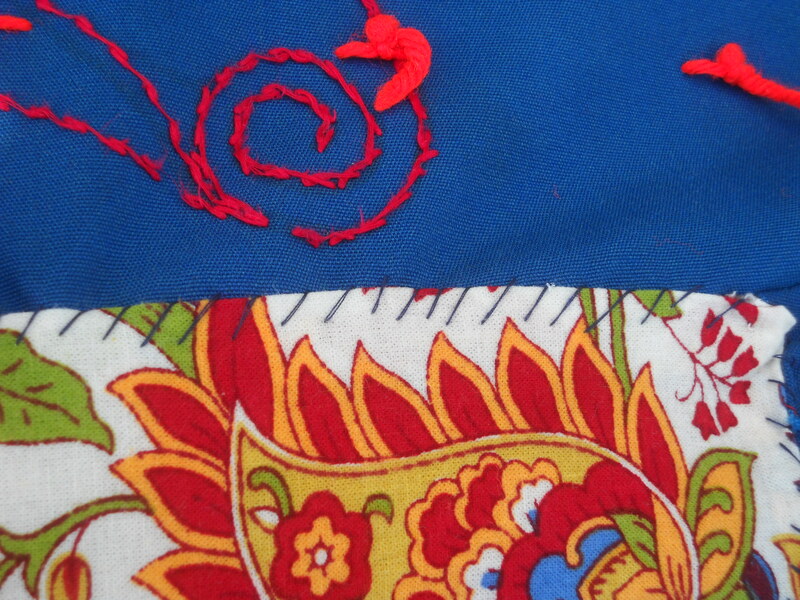 She patched these squares together with squares of cloth she had taken from old shirts, skirts, and jeans. The skeleton around the patches was dark blue broadcloth (I think that’s what you call it). The quilt warmed our beds in our dumpy Salt Lake City apartments. The quilt was bright, bold, and strong, just as we all felt back then. I gather now that I wasn’t supposed to wash the quilt as much as I did. However, there were the two of us and two babies (mewling and puking), and I like things clean. Please keep this in mind for a few paragraphs. Way Back: I never could sew and I can’t sew now. I mean, I can sew on buttons and fix little rips and that is it. Because I wanted to make Christmas gifts by hand for my kids and because I was poor, I did piece together a few flannel nightgowns, some stuffed animals, and, I believe, a Superman cape for Robert, and sleeping bags for Martha the doll and Railroad Dog the stuffed animal. Way Way Back: I’m so old, I was required to take Home Ec when I was in 7th grade. I made the worst, the ugliest, the craziest-pleated kilt in Milford (MI) Junior High history. I kept it for years, although I do not know why. Please keep this mind, too. Fifteen Years Ago: Some of the patches on the wedding quilt were falling apart. Maybe I had washed it too much. 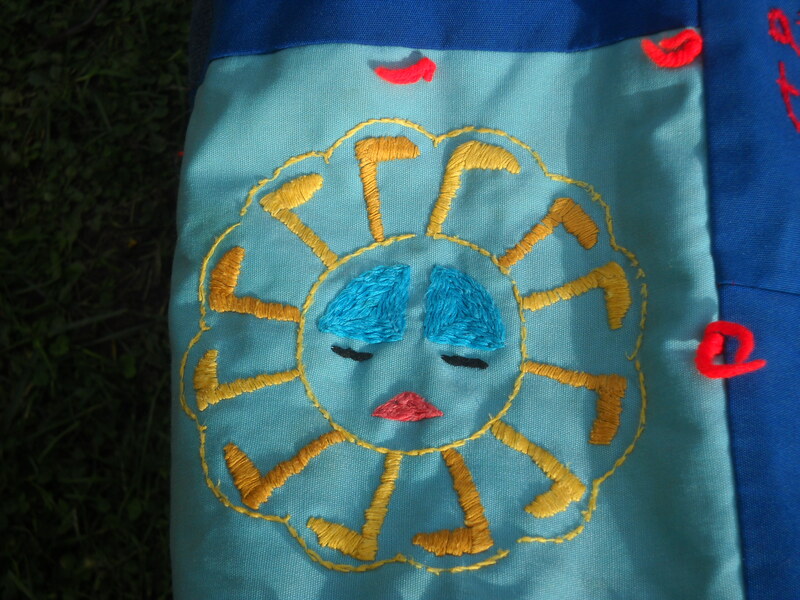 A few patches almost disappeared along with some of the embroidery. We bought bright—but not as bright—quilts and coverlets at L.L. Bean and packed the wedding quilt away. Not Too Many Years Ago: Tom and I started thinking about what we might do when we retired. 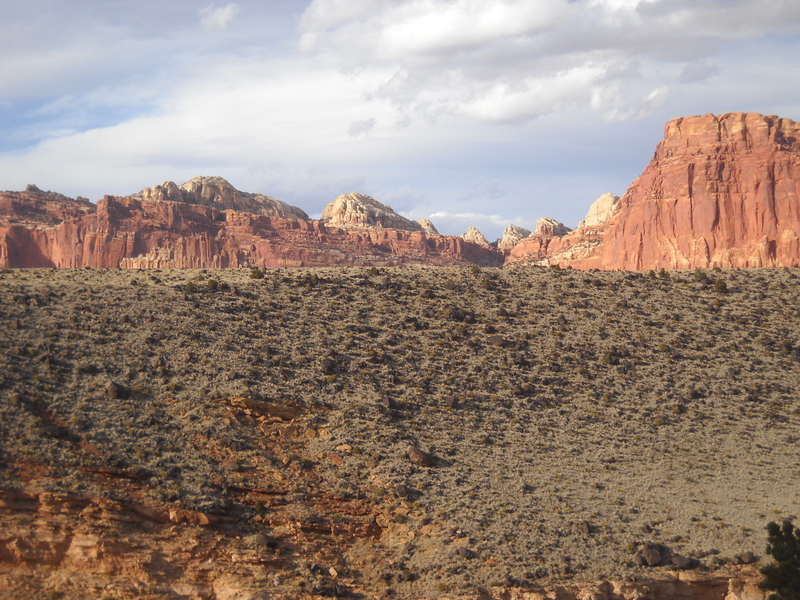 We planned to travel back to Utah and explore the places we’d missed, like Capitol Reef and Escalante. We told Betsy we’d pick her up from her little Utah town and go adventuring together again. Five Years Ago: Betsy just up and died and we miss her. 2013: A) Tom and I went adventuring on the Colorado Plateau. We saw Black Dragon Canyon with Blaine and Bonnie, but Betsy, their dear friend, wasn’t there. We camped in Capitol Reef and it was even better than we had imagined. B) We got back to our house in Charlottesville, Virginia. We took some paintings out of storage. The wedding quilt was protecting one of the paintings. 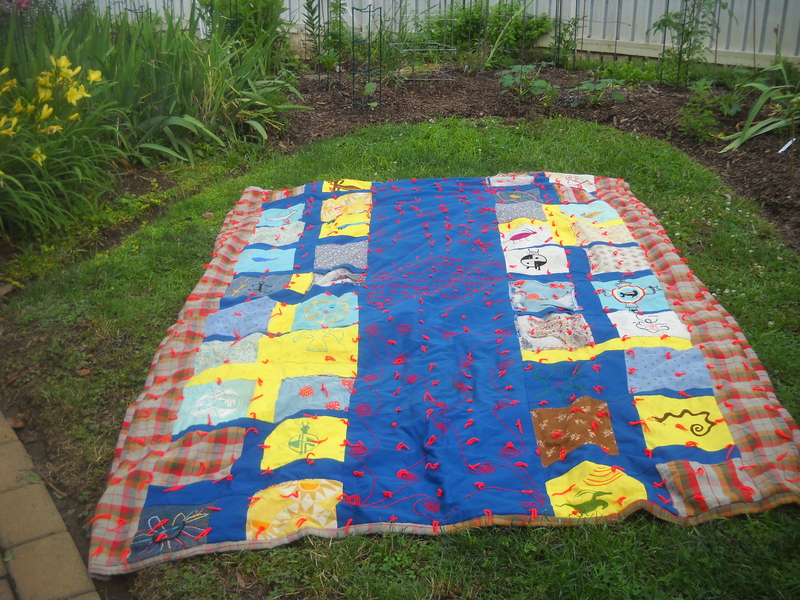 We lay the quilt on the lawn and saw that, really, only a handful of patches needed to be repaired. Two Weeks Ago: I can’t sew worth anything, but I finished repairing the wedding quilt. It lies now on our bed and we will put it in the camper to go back to Utah when the new year comes. Although the quilt, and we ourselves, are not as bright, bold, and strong as when we were young, it’s alright, and, this time, Betsy will come along with us. 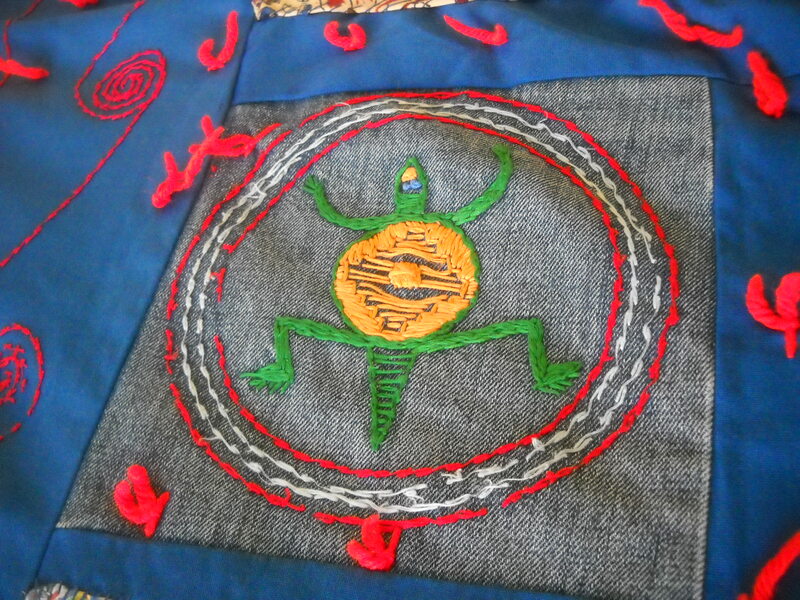 This entry was posted in Memoir, Places and tagged Black Dragon Canyon, Capitol Reef, Hopi designs, Milford Junior High, Milford Michigan, quilt, Salt Lake City, sewing, wedding gift on October 29, 2013 by lyndaterrill. In my last post, I noted that I thought my physical flexibility was lessening somewhat. I am not happy about that, but my chief concern is that I remain (or maybe the correct phrase is become more) mentally and emotionally flexible. I now like to listen to opera. This is not because I’ve changed my bourgeois Midwestern spots. 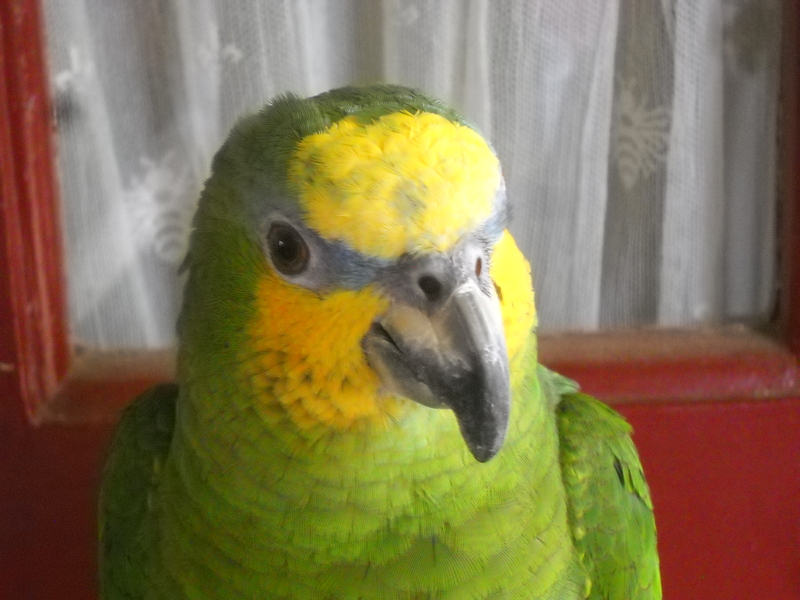 It’s just that our parrot friend Phoenix enjoys opera and I trust his instincts. I used to despise eggplant. I don’t blame myself. I think when I was young, I only had tasted horrible school-lunch style eggplant parmesan. I mentioned this dislike to an Afghan student. She said that she would change my mind when I tasted her eggplant dish. She was right and between the baba ganoush and that Chinese dish of fried eggplant with lots of garlic, I am now a dedicated fan. 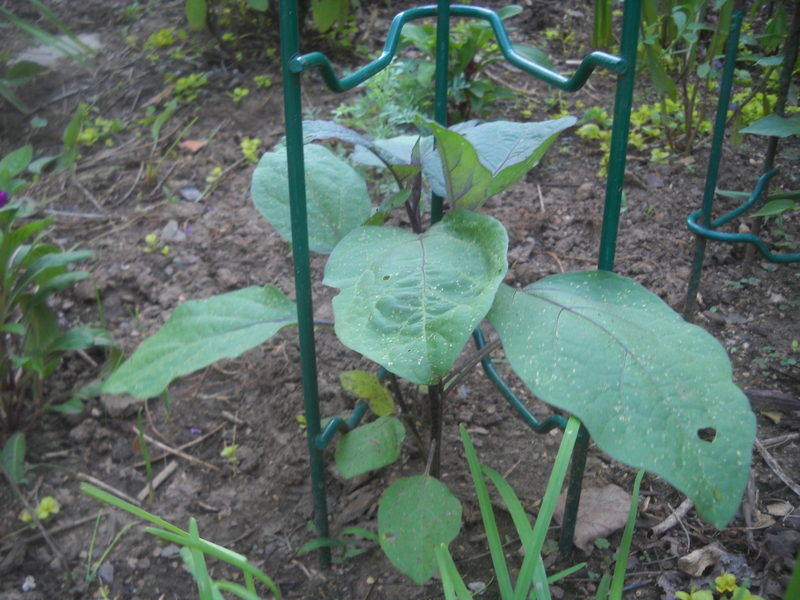 In fact, I am growing four Japanese eggplants this year (a huge crop when one gardens on 1/20 of an acre as I do). Time was—back when I was a new gardener—just sighting a slug was cause for loud complaints and gross-out noises. There was the time I ran barefooted to answer the phone and stepped on a giant, spotted, end-of-summer specimen. I washed off my foot in the tub for five minutes. The thought of slug slime on my foot was just too much for me to bear. It’s been a rainy spring and early summer here and just last week, I flipped a page of The New York Times Magazine, which had been out on the patio, and found a slug making itself comfortable inside. I took the slug outside and, with Tom’s help, we liberated it. 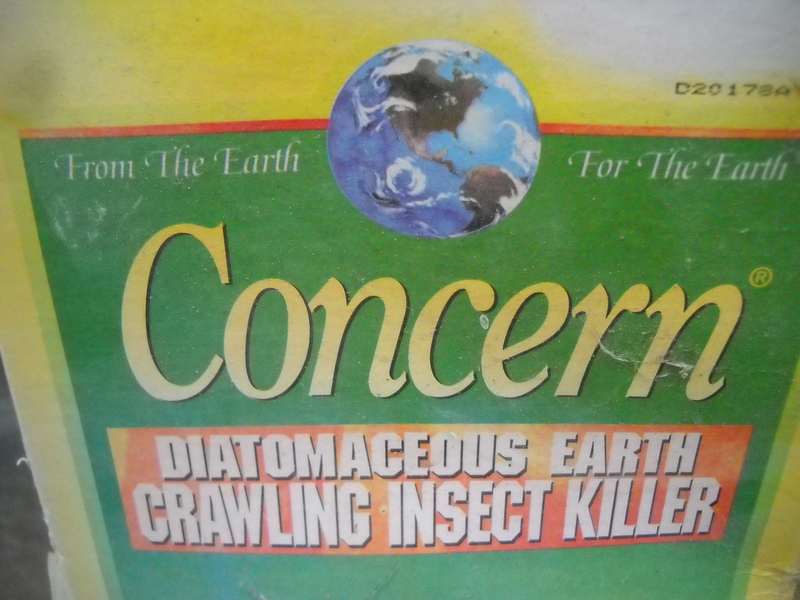 I don’t usually even sprinkle my diatomaceous earth around the vegetables to tear the slugs’ little bodies. Life’s tough enough all around already without it. 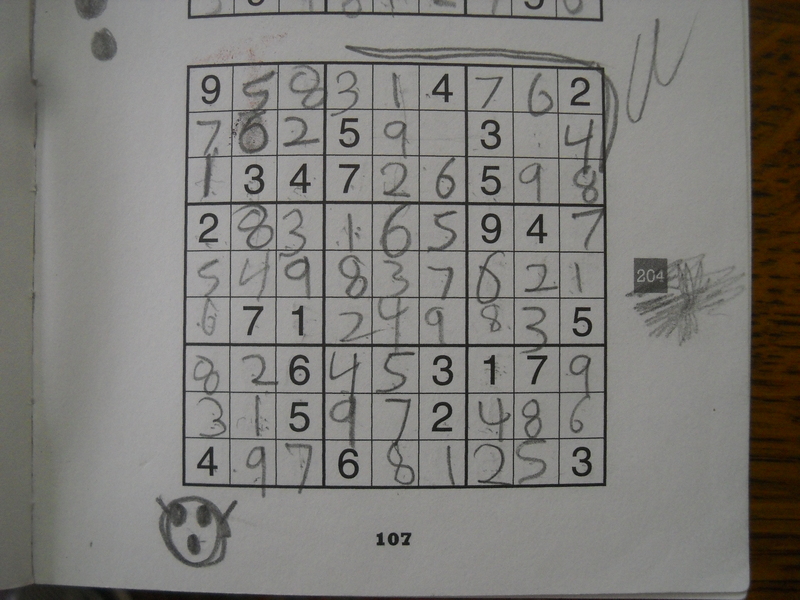 About five years ago at one of our Deep Creek, Maryland family meetings, one of my sisters-in-law introduced me to Sudoku. Not only introduced me, but left her puzzle book for me to finish. She told me that, to begin with, it was okay to fill out a few of the squares—using the answers in the back—to help me get the idea. Well, it took me more time than I want to admit to figure out the logic involved in Sudoku, and I still cheat on every game I play. At first, I kept playing because the puzzles were fun and because I love my sister-in-law and her book. Later, I played compulsively to help me through a tough patch or two. Also, at the back of my mind, I remembered that pop culture tells us that doing this stuff (crosswords, playing bridge, etc.) is supposed to help keep our cognitive functioning up to snuff—flexible, that is. I have about a fifth of the puzzles in the book yet to complete, so I guess I will see whether my slow and unsteady pace wins the prize of maintaining well-oiled cognition. I was the youngest of five children and so I never spent too much time alone when I was growing up. I had roommates in college and at my first jobs away from home. Then, for two quarters—maybe one—when I started graduate school, I lived alone in a cellar—more or less—in Salt Lake City. Some things happened there. A figure crouched at my window in the night staring down at me in my cellar. A thief robbed me of my Zuni bracelet, my mother’s brooch, and the Swiss Army knife I kept by my bed for safety. Many early mornings a greasy crone greeted me when I stumbled from my little space through the laundry area to my even smaller bathroom. I was not a success first time out alone. So, later on, married with kids, I used to worry when my husband would go away on business trips. I don’t know what I expected. We had nothing much to steal and, by this point, we lived in nice neighborhoods. When the children got a bit older and life became—let’s say—complicated and, maybe, not easy, I learned something new. The scary things were no longer separate from me crouching above my bed the way they had been when I was young. I realized that the fear, insecurity, and pain were inside of me. I became flexible (and resilient) because I had to do so. And I keep trying most days. I’m younger than that now” (from My Back Pages) and it has seemed true for me, whenever I shook loose of the bitterness. Also, I am a stick-in-the-mud about many things–from how I put dirty dishes in the dishwasher to my politics. Furthermore, I am becoming less flexible and resilient about driving. This entry was posted in Memoir and tagged A Dialogue of Self and Soul, Bob Dylan, flexibility, memoir, Salt Lake City, slugs, Sodoku, W.B. Yeats on July 1, 2013 by lyndaterrill.